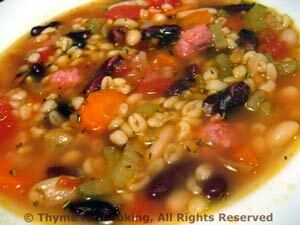 Bean and Barley Soup, Thyme for Cooking classic winter soup. Fry sausages in a large skillet, browning nicely. Remove and slice, .5" (1.5cm) thick. Roughly chop onions and celery. Slice carrots, cutting in half if rounds are too big. Heat oil in medium pot or Dutch oven. Add onion, celery, carrot and garlic, sauté until tender. Add all remaining ingredients, except sausage, cover and simmer 30 minutes. Add sausages and simmer 5 minutes longer. Serve.